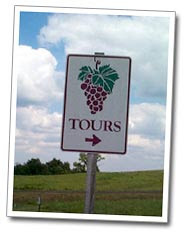 The Virginia Winery Tour sign - Where the fun begins! Have you read? In the July 2007 issue of Travel & Leisure Magazine the state of Virginia is recognized as one of the Top 5 new winery travel destinations in the world! 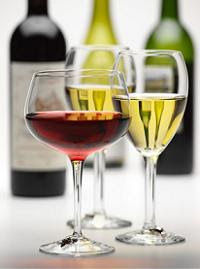 Bruce Schoenfeld, the magazine's wine editor features Virginia in a list that includes some pretty hot wine producing regions - New Zealand, Italy, Spain and Chile. Mr. Schoenfeld’s list is based on 'hot new' travel destinations for those passionate about good wine, great food and enjoyable and memorable experiences. With over 120 operational wineries, summer is a good time to saddle up and jump on the Virginia Wine Trail and experience the beautiful Virginia countryside, gourmet restaurants, historic landmarks, family farms, Mom & Pop Shops, and those burgeoning Virginia wineries that completes the fun-filled package. If wine is pleasure, and pleasure is wine, then you have come to the right place for enjoyable and memorable winery experiences in picturesque settings. 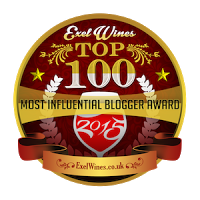 There are a number of resources such as my handy wine blog and the Virginia Wines - Aged to Perfection site to get familar with what is going on here. Want to know which Virginia bottle of wine did it for Mr. Schoenfeld? Click here to read the article, which makes for a very nice read and has me itching to visit New Zealand and Spain sooner than later. In closing, all it takes is exposure for palates from across the globe to discover the remarkable progress and brilliant future the Virginia wine industry is establishing for itself. Stay tuned, Dezel has a concert and a great local Cabernet Franc to tell you all about.